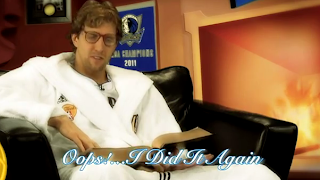 Dirk Nowitzki peforms dramatic reading of "Oops I did it again"
Add comedy to the list of things Dirk Nowitzki can do better than most of the NBA. Whoever is in charge of the Mavericks social media and marketing deserves high praise. Who knew hearing the lyrics to "Oops I did it again" in a German accent could be so entertaining?